Telltale Games has launched a Sam & Max 2010 website with good deals, free stuff and the promise of more zany antics from the Freelance Police. 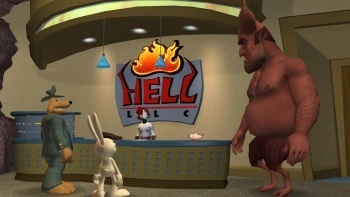 It's not exactly hot on the heels of their successful comeback at Telltale, but the anthropomorphic dog and hyperkinetic rabbity thing better known as Sam & Max are poised to appear in their third season of episodes in 2010. Nothing is known about where their latest adventures will take them, but the Sam & Max 2010 website does offer a cryptic insight into what the future may hold. "In all the universe, the only power beyond the mind's comprehension is the power to comprehend the power of the mind," it says. "If anyone of us could unlock this terrible power, would we use it to explore the mysteries of the infinite? Or would we use it to destroy?" Hey, I have no idea, but I do know that if you sign up for the Freelance Police Special Forces you'll get email updates about the progress of the game, good deals on one or both of the previous seasons and a free copy of Ice Station Santa, a festive way to introduce yourself to the weirdness and wonder that is Sam & Max. Get some barefoot screaming justice of your own at telltalegames.com/samandmax2010.